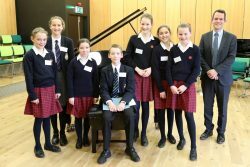 This year’s annual visit to the Pangbourne Piano Festival was a resounding success. 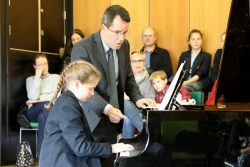 A small group of pupils came from both Cranleigh Prep and Cranleigh Senior Schools with their parents and Head of Piano, Dr Marie Ward. Edward T won the Solo Intermediate class, with Josie H coming runner-up in the Solo Novice class and Ted S gaining a Highly Commended in the same class. Dr Marie Ward says “Our pupils all did brilliantly. The competition was fierce, with more than 100 students from other independent and state schools in the south of England, also taking part. The adjudications (in the form of masterclasses) were also highly informative. It was an excellent and educational experience for all”.